New York: South Korean electronics giant Samsung has unveiled its new range of high-end, Android-based tablet, `Galaxy Tab S, with an emphasis on entertainment and media. Available in two sizes of 10.5 and 8.4 inches, these are the company's thinnest and lightest tablets to date. The tablets will be available for sale in the US in July and will be priced at USD 399 for the smaller model and USD 499 for the larger one. "Tablets have evolved significantly in the past few years in function and purpose. The Tab S is our best tablet ever, elevating it to flagship status within our tablet portfolio," president and Head of Sales and Marketing at Samsung's IT and Mobile Communications Division, D J Lee told reporters at a preview in Manhattan. He said tablet shipments could reach 290 million units worldwide this year and eventually will surpass those of laptops and desktops computers. Lee said through the new range tablets, Samsung aims to increase its share in the tablet market, which has been dominated by technology giant Apple. Samsung is the world's second-largest maker of tablets, behind Apple and its iPads and its global tablet market share has been growing at the expense of Apple's. It shipped 16. 4 million units in the first quarter of 2014, according to research firm IDC, down from 19.5 million units in the first quarter of 2013. IDC expects global tablet shipments to rise only 12 per cent this year to 245.4 million units, as against a 52 per cent increase the year before. "The tablet is becoming a popular personal viewing device for enjoying content, which makes the quality of the display a critical feature," Samsung's CEO and president of IT & Mobile Division, J K Shin said. The Galaxy Tab S has an adaptive display which automatically adjusts saturation and sharpness based on the application being viewed, the colour temperature of the viewing environment and ambient lighting. 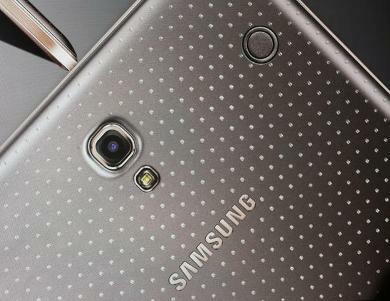 The tablets will use Samsung's organic light emitting diode or OLED display and have an 8-megapixel rear camera. Samsung has also partnered with Google Play, Google's online digital entertainment store offering apps, games, music, movies, books and magazines.